The close of winter and promise of spring are making us Northern Virginians anxious for some outdoor living! Now is the time to maximize your yard and create a dining and entertaining space that compliments your indoor kitchen. With an outdoor kitchen you can prepare meals and be around your guests with minimal time spent running inside for forgotten items. 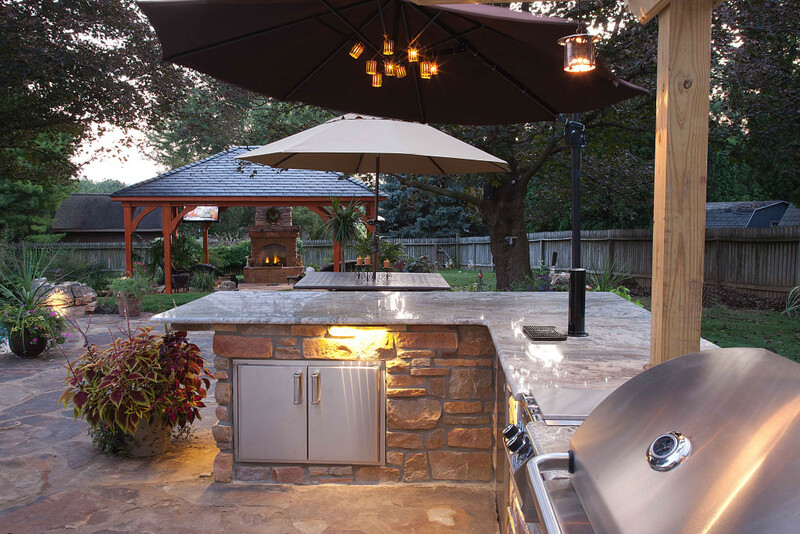 Here are some considerations when developing your new outdoor kitchen. Choosing the optimal location for your outdoor kitchen can have a major impact on your budget. Ideally, the site should easily connect to home utility sources and be accessible to your indoor kitchen. Your outdoor kitchen will also need shelter from wind, rain and extreme sun. Consider your workflow and how your indoor and outdoor spaces will be used together. Design your space according to functional zones, including preparation, cooking, serving, entertaining and cleanup. For example, it’s important to separate beverage serving areas from food prep and cooking to minimize disruption while meals are being prepared. You know what they say about too many cooks! 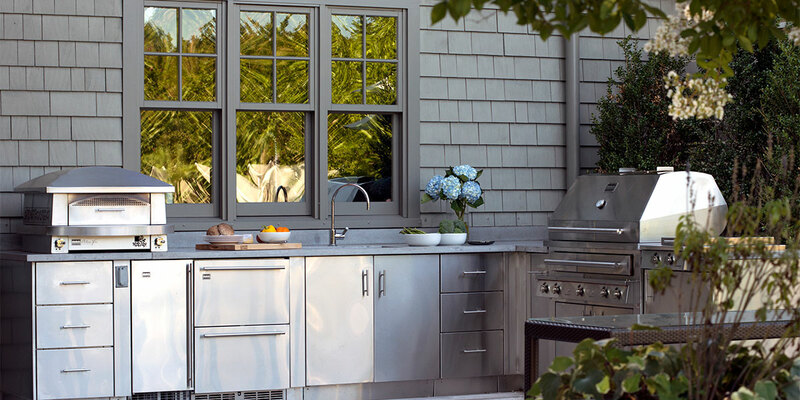 A luxury outdoor kitchen may contain just as many appliances as an indoor gourmet kitchen. 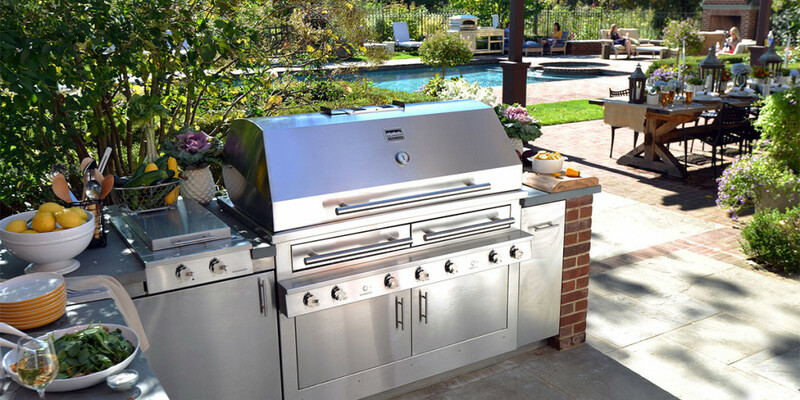 Grills, smokers, pizza ovens, cooktops, refrigerators, ice makers, recessed blender stations, sinks, and wine and keg reserves are commonplace in outdoor kitchens. Determining the frequency of use and types of meals to be served in advance of your project will inform your appliance selections. Appliances should come from companies specializing in outdoor kitchen supplies. 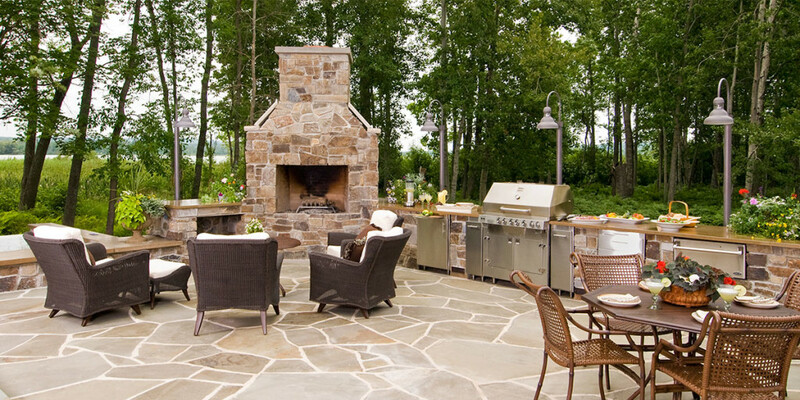 The look and feel of your outdoor kitchen should be in harmony with the design of your home. Use compatible materials and incorporate subtle architectural details to create a space that’s a natural extension of your house. Durability is key when choosing materials and finishes for your outdoor kitchen. Everything has to be waterproofed. Selecting low maintenance materials and equipment that withstand the impact of outdoor elements is critical. High-quality stainless steel provides a sanitary surface that’s easily cleaned and corrosion-resistant. Counters and patio or decking material should be resistant to grease stains and able to withstand high temperatures. For flooring, avoid materials that may become slick when wet, such as tile or marble. Natural stone blocks with low porosity, such as granite, sealed pavers or concrete work best for outdoor flooring. Determining how many supplies you need on-hand, such as utensils, pots and pans, serving ware, etc., will determine your need for storage. Planning ahead will eliminate the need to go in and out of the house for supplies. Like everything else, storage cabinets must be waterproof and resistant to rot. High quality stainless steel that matches a grill is a good option for cabinets. Much like indoor kitchens, lighting is an essential element of your outdoor space. Adequate task lighting for food prep and cooking, as well as ambient lighting for after-dark dining and entertaining, are important. There are endless options for dining spaces within your new outdoor kitchen. Do you regularly entertain large groups of guests or only need accommodations for a small family? Consider creating a bar counter connected to your countertop so guests may sit on stools and chat while you’re working. A bar also can be conveniently used for serving and setup. Durable outdoor tables and chairs can look and function as well as any formal dining room set. Consider the placement of seating spaces to eliminate smoke and splatters from prep and cooking areas. Spring is just around the corner, now is the time to plan and build your versatile outdoor kitchen. Give us a call at 703-255-9861 today to get started. Craving more tips? Check out this infographic from Kalamazoo Outdoor Gourmet.